Died: 21 April 1949, Johannesburg, South Africa. Robert B. Young, geologist, was the son of Andrew Young and his wife Lilias Burns, and a younger brother of the geologist Andrew Young*. He obtained the degree Master of Arts (MA) at the University of Glasgow in 1897, then entered the University of Edinburgh and graduated as Bachelor of Science (BSc), with distinction in geology, in 1903. That same year he was appointed as geologist to the Bathymetric Survey of Scottish freshwater lochs. He was elected a Fellow of the Royal Society of Edinburgh in 1904 and a Fellow of the Geological Society of London not long thereafter. Young came to the Cape Colony for the second half of 1903 to take over his brother Andrew's geology classes at the South African College, Cape Town, while the latter was on leave following a serious illness. On completion of his duties he visited the Witwatersrand and there accepted an appointment as the first professor of geology and mineralogy at the Transvaal Technical Institute, which opened early in 1904. He remained head of the department until his retirement in 1934, setting high standards of scholarship, dedication and hard work. During this period the institute developed into the Transvaal University College (1906), the South African School of Mines and Technology (1910), and eventually the University of the Witwatersrand (1922). Young was the only lecturer in geology until 1912, when D.P. McDonald* was appointed. Later members of staff included his former students Edna Janisch (1924) and Edgar Mendelssohn (1927). Young was an able teacher and his department played an important role in providing trained geologists to the mining industry. He was a forceful person and a good administrator, serving as chairman of the university's senate for many years, as a member of the university's first council, and as chairman of the government's Research Grant Board. Young was always actively involved in research. During the first few years he wrote a biography of G.W. Stow*, The life and work of George William Stow, South African geologist and ethnologist (London, 1908). At this time he was chairman of the Commission on Bushman Paintings appointed by the government of the Transvaal Colony. His geological research initially focussed mainly on the petrology, mineralogy and economically important minerals of the gold-bearing conglomerates of the Witwatersrand. In "Further notes on the auriferous conglomerates of the Witwatersrand, with a discussion on the origin of the gold" (Transactions of the Geological Society of South Africa, 1909) he drew attention to the presence of payshoots of richer reefs which had not been recognised previously, the most important one occurring on the eastern part of the Central Rand. He believed that shallow water conditions prevailed throughout Upper Witwatersrand times and that the strata had accumulated in an area of subsidence with a slowly encroaching sea. Other papers published by him in the same journal dealt with "The replacement of quartz by carbon in the Rand banket" (1910), "Notes on the origin of the iridosmine in the banket" (1912), "Notes on the pebbles of the Rand banket" (1912), "Note on the diamonds in the banket" (1913), and "Metasomatism in the banket" (1914). His research was eventually written up in the form of a book, The banket: A study of the auriferous conglomerates of the Witwatersrand and the associated rocks (London, 1917, 125p), which became a standard work of reference. For this work the University of Edinburgh awarded him the degree Doctor of Science (DSc). Young's other research included a study of a unique natural source of carbon dioxide on the farm Hughenden, near Harding, KwaZulu-Natal. The gas issued from joints in the Dwyka tillite, particularly after heavy rain. He described the phenomenon in "Exhalations of carbon dioxide in Alfred County, Natal" (Ibid, 1923). Around this time he began to conduct intensive research into the origin of the dolomites of the Transvaal and Griqualand West. He was the first to recognise stromatolites as the products of ancient algal structures, and to separate them clearly from other features of non-organic origin. After his retirement he built a fully equipped laboratory at his home in Houghton, Johannesburg, where he continued this research. The results were reported in the following series of papers in the Transactions of the Geological Society of South Africa: "Pressure phenomena in the dolomite limestones of the Campbell Rand Series in Griqualand West" (1928), "The occurrences of stromatolitic or algal limestones in the Campbell Rand Series, Griqualand West" (1932), "Conditions of deposition of the Dolomite Series" (1933), "A comparison of certain stromatolitic rocks in the Dolomite Series of South Africa with modern algal sediments in the Bahamas" (1934), "Alterations effected by solutions in the limestones of the Dolomite Series" (1934), "Further notes on algal structures in the Dolomite Series" (1940), "Note on an unusual type of concretionary structure in limestones of the dolomite series" (1940), "The domical columnar structure and other minor deformations in the Dolomite Series" (1943), "Nodular bodies in the dolomite series" (1945), and "Domed algal growths in the dolomite series of South Africa, with associated fossil remains" (with E. Mendelssohn, 1948). Many foreign geologists working on algal structures in ancient limestone visited his home laboratory. In the course of his investigations of the dolomites Young became interested also in the tuffa deposits of Griqualand West, which he described in "The calcareous tufa deposits of the Campbell Rand, from Boetsap to Taungs native reserve" (Ibid, 1925). The deposit at Taung, on the edge of the Ghaap plateau, contained many fossil baboon remains. Among the specimens set aside for him by the limestone miners was a juvenile skull which he forwarded to the anatomist Professor Raymond Dart. The latter identified it as a new hominid, which he named Australopithecus africanus, and which contributed significantly to our understanding of human origins. After his retirement Young remained active as geological consultant to a mining house. 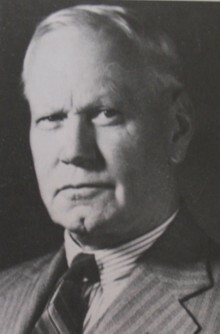 Among other appointments he served as chairman of a government commission of enquiry into the base mineral industry (1940) and was chairman of the Diamond Control Board. He became a member of the South African Philosophical Society in 1905, remained a member when it became the Royal Society of South Africa in 1908, and was elected a Fellow of the latter in 1914. During 1921-1922 he served as a member of the society's council. He played an active role in the affairs of the Geological Society of South Africa, which he joined in 1904, serving as honorary secretary in 1909 and again from 1916 to 1925, and as president in 1910 and again in 1926. His presidential addresses dealt with "The problem of the Rand banket" and "The history of the Geological Society of South Africa". He received the society's Draper memorial medal in 1935. By 1906 he was a member of the South African Association for the Advancement of Science, served on its council for 1907/8, was president of its Section B (which included geology) in 1913, and in 1925 received the association's South Africa Medal (gold). He also joined the British Association for the Advancement of Science during its first visit to South Africa in 1905, and during its second visit in 1929 was joint vice-president of its Section C (Geology). He became a member of the South African Geographical Society in 1917, the year of its formation, and served on its council from 1917 to 1919. The University of the Witwatersrand conferred an honorary Doctor of Laws (LLD) degree upon him in 1937, and the University of Cape Town an honorary Doctor of Science (DSc) degree in 1935. He was married to the violinist Janet F. Algie, but they had no children. Anhaeusser, C.R. (ed.) A century of geological endeavour in southern Africa, 1895-1995 (pp. 15, 16, 20, 26, 118-119, 258-260). Johannesburg: Geological Society of South Africa, 1997. British Association for the Advancement of Science. Report of the ninety-seventh meeting, South Africa, 1929. Draper Memorial Medal. Transactions of the Geological Society of South Africa, 1935, Vol. 38, pp. lxvii-lxviii. Geological Society of South Africa. Proceedings, 1915, Vol. 18, p. xiii-xix, and 1920, Vol. 23, p. xii-xvi: Past Presidents, Past secretaries, and Lists of members; Transactions, 1906, Vol. 10, List of members. Geological Survey. Bibliography of South African geology, 1936-1956. Pretoria: Government Printer, 1972. Hall, A.L. A bibliography of South African geology.... Pretoria: Geological Survey, Memoirs No. 18(1922), 25 (1927), 27 (1931), and 30 (1937). Pretorius, D.A. The depositional environment of the Witwatersrand goldfields: A chronological review of speculations and observations. Mineral Science and Engineering, 1975, Vol. 7, pp. 18-47. Royal Society of South Africa. Transactions, 1908-1910, Vol. 1; 1917, Vol. 6; and 1925, Vol. 12. Sixteenth award of the South Africa Medal and grant. South African Journal of Science, 1925, Vol. 22, pp. xxxiv-xxxv. South African Association for the Advancement of Science. Report, 1905/6, 1907, 1910, 1913, 1918. South African Geographical Journal, 1917-1919, Vol. 1-3, Lists of members and office bearers of the South African Geographical Society.